Most of the kids lover Astronomy. These Fun Equations of Mathematics are dedicated Astronomy. 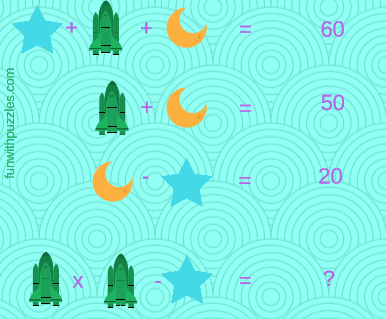 In this Mathematical Puzzle Question there are fun equations. In these fun equations, variables are replaced with astronomical objects. Can you find the values of these objects and then solve the last equation to calculate the number which will replace the question mark? Can you solve this Fun Equations of Mathematics? Answer of this "Fun Equations of Mathematics", can be viewed by clicking on button. Please do give your best try before looking at the answer.